Yaa it is not that fancy fairy tale or some sort like kdrama. But still amazed me in so many ways. Haa I pray I cud be like you. Haha. Anyway. Congratulations on ur weeding. I pray for your happiness till jannah. U r such lucky girl kak. Bcoz most of malay girls skrg dream to have a korean man to be their hubs.hehehe. may Allah bless both of you. 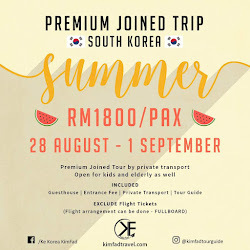 Nanti saye dtg korea saya na mai jumpe akak. Btw akak org johor ke? like the way you keep it halal in modest way first. salam. hye. terbaca pasal adik kat Oh Bulan nye page. 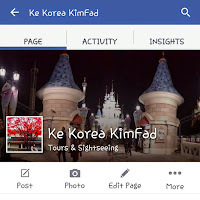 pastu ter'like' plak page travel ke korea tu. hehee.. macam menarik jer. Salam kenal. so hows life as marriage partner? Pasal walimatulurus jangan risau, boleh diuruskan bila dah masing2 free ok. As long as both of u are in your halal way right now. That's all matters. My marriage is also while im still studying and we still haven't go to our honeymoon phase yet. Lol. actually everyday is honeymoon for newlyweds. Where else can u spend time with your so called boyfriend 24/7 right? First year of marriage we went to study for 3 years. And today is our 4th years. Hardwork, struggle? Yes. But with you soulmate partner there, what more can u ask right? Semoga dipermudahkan semua pelajaran dan majlis akan datang. Love to read about ur love story (after it went viral). Wish you both a blessing love till Jannah. 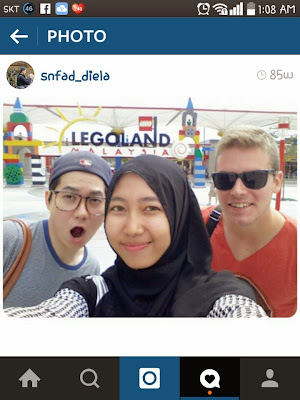 Aaaaaa.. Kak, ure such a lucky girl! .-. So sweet and nice story of yours to tell your little 1 soon...Amin.Btw inshaalah if i go to korean i will contact you for the tourist guide and to brings me to 1 special place...SanKwanKyun College...2y ago watching the korean Drama about the college with my daugther(7y-at that time) she love it, 1st korean drama that attract her. Watching with her i am flood with millions of question..its was fun so i promise her, that i will bring her to that place when we go to korean. May allah bless you both and good luck with your study ok. So sweet n Congratulations on ur weeding..akak ciku akan baca every ur post insyaAllah.Baru jumpa blog ni.moga bahagia till jannah. Xpe.. Nnt free boleh buat walimah :) yg penting nikah dah. This should go viral. I mean seriously. End up i read your blog after stalk ur IG which is not private and i like the way you use to tell the world by your picture. Originally i know about you from Faizdickievp. Amazing. Just that. So sweet..suka sangat tengok kak fad happy dengan si dia..
so sweet..ssuka tengok kak fad happy dengan si dia..
May Allah grant you happiness for you and your family for the rest of your life. Kak Fad tahniah.. So sweet. Semoga bahagia selalu. Like you and your husband. Seriously I admire with you guys.. especially you Fathi. Well, you must be good in study cause get to go overseas... :) I wish I could be as same as you.. hehe.. Well, congratz for you guys being together.. Wish you guys happy and together until Jannah. (*even though late-wish but still..) <3<3 love to hear you guys story..